Now a Major Motion Picture titled WHISKEY TANGO FOXTROT starring Tina Fey, Margot Robbie, Martin Freeman, Alfred Molina, and Billy Bob Thornton. From tea with warlords in the countryside to parties with drunken foreign correspondents in the "dry" city of Kabul, journalist Kim Barker captures the humor and heartbreak of life in post-9/11 Afghanistan and Pakistan in this profound and darkly comic memoir. As Barker grows from awkward newbie to seasoned reporter, she offers an insider's account of the region's "forgotten war" at a time when all eyes were turned to Iraq. Candid, self-deprecating, and laugh-out-loud funny, Barker shares both her affection for the absurdities of these two hapless countries and her fear for their future stability. "Remarkable. . . . [Barker] has written an account of her experiences covering Afghanistan and Pakistan that manages to be hilarious and harrowing, witty and illuminating, all at the same time." "Politically astute and clearly influenced by Hunter S. Thompson, Barker provides sharp commentary on the impotence of American foreign policy in South Asia after the victory against the Taliban. . . . Fierce, funny and unflinchingly honest." "Candid and darkly comic. . . . With self-deprecation and a keen eye for the absurd, Barker describes her evolution from a green, fill-in correspondent to an adrenaline junkie." "Brilliant, tender, and unexpectedly hilarious." Read the book, then go see the movie! WHISKEY TANGO FOXTROT, the upcoming movie starring Tina Fey, Margot Robbie, Martin Freeman, Billy Bob Thornton and Alfred Molina, is based on Kim Barker's memoir of her time reporting in Afghanistan and Pakistan. Kim uses her sharp wit and humor to describe her dangerous and exciting time in these troubled countries in her book, WHISKEY TANGO FOXTROT (Anchor; February 23, 2016). Kim first arrived in Kabul in 2002, with nothing more than a passport and a dire need for a translator. Despite the dangers and the shaky circumstances, Kim's love for these countries grew, as did her fear for their future sustainability. After five years spent wearing a scarf, abiding by the cultural norms and traveling long hours on unpaved roads, Kim returns to America and is eager to tell of her long-lasting love story with these countries. Kim Barker was the South Asia bureau chief for The Chicago Tribune from 2004 to 2009, based in New Delhi and Islamabad. Her book about those years, The Taliban Shuffle: Strange Days in Afghanistan and Pakistan, a dark comedic take on her time in South Asia, was published by Doubleday in 2011. 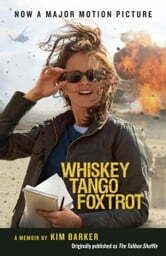 The movie version, WHISKEY TANGO FOXTROT, will be released in March 2016, starring Tina Fey, Martin Freeman, Alfred Molina, Margot Robbie and Billy Bob Thornton. Barker has covered natural disasters such as the tsunami in Asia and the earthquake in Kashmir, as well as tracked manmade disasters — the rise of the Taliban in Afghanistan and Pakistan, the corruption in Afghanistan, and the assassination of former Pakistani Prime Minister Benazir Bhutto. Before going overseas, Barker worked at The Seattle Times and the Spokane Spokesman-Review. After coming back in 2009, she was the Edward R. Murrow press fellow at the Council on Foreign Relations, where she freelanced for Foreign Affairs, Reader's Digest and The Atlantic. In 2010, she joined ProPublica, where she wrote about campaign finance and the fallout of the Supreme Court’s Citizens United decision. Barker, who grew up in Montana and Wyoming, now lives in Brooklyn and works as a New York Times metro reporter specializing in investigative reporting and narrative writing. Enter to win one print copy of Whiskey Tango Foxtrot by Kim Barker. This giveaway sponsored by Wunderkind-PR and is open to US residents only (sorry). This giveaway ends on March 2, 2016. The winner will be announced on March 3, 2016.